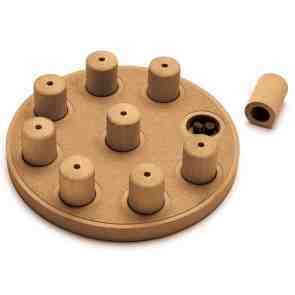 Advanced level interactive dog puzzle. Intermediate level interactive dog training/brain game! If your dog is good at solving puzzles, introduce them to a new challenge by simply twisting the bones on top to lock the drawers. 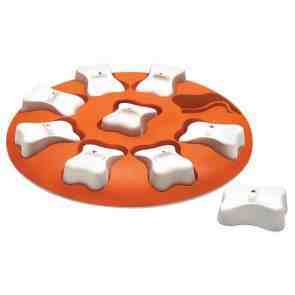 12.75" x 9.25" x 2"
The Nina Ottosson Dog Smart is an entry level dog game that challenges your dog to uncover treats while helping them to develop new learning techniques. 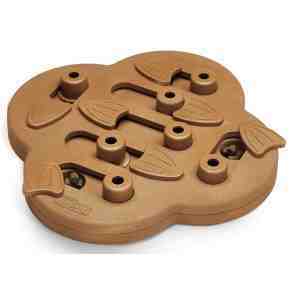 10.5" x 9.25: x 2.25"
The bones in this dog puzzle can be arranged to be flush with the board or elevated for different levels of challenges. 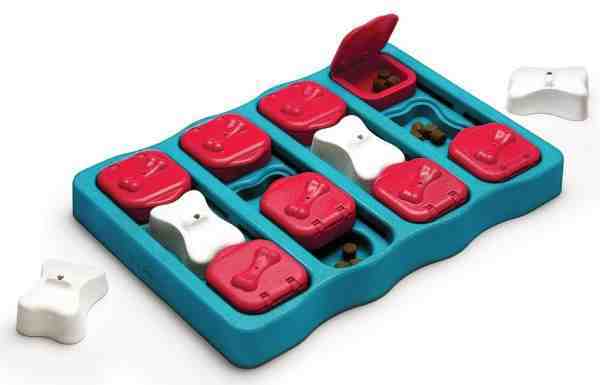 12.25" x 11.25" x 1.75"
With 12 treat compartments in this dog game, The Dog Tornado by Nina Ottosson is smart and fun choice for mealtime as it holds your dog’s favorite wet or dry kibble. 11" x 7.5" x 3.25". 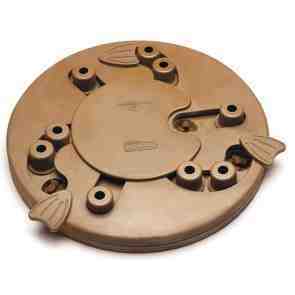 Elevated play pieces in this Dog Worker help dogs retrieve treats and move pieces while keeping them entertained and engaged with no interference to fun! 15" x 14" x 2.5". This dog game has built in play pieces that don’t come out when your dog plays with it. 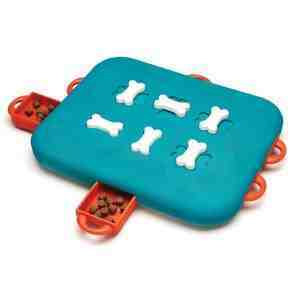 Durable construction also helps to keep this dog toy intact, making it your new go-to dog game time after time. 14.5" x 11.75" x 2". 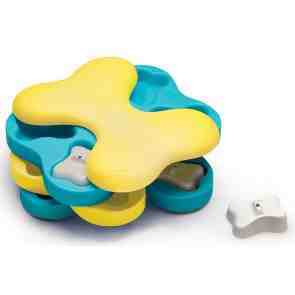 This treat dispensing dog puzzle releases treats from 2 entry points: one on each side of the saucer. 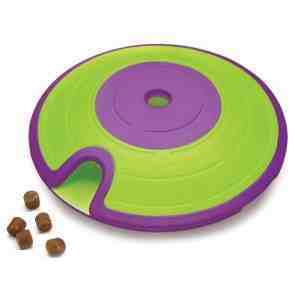 Put treats in both sides of the top center hole & watch as your dog puts it in motion to release them. 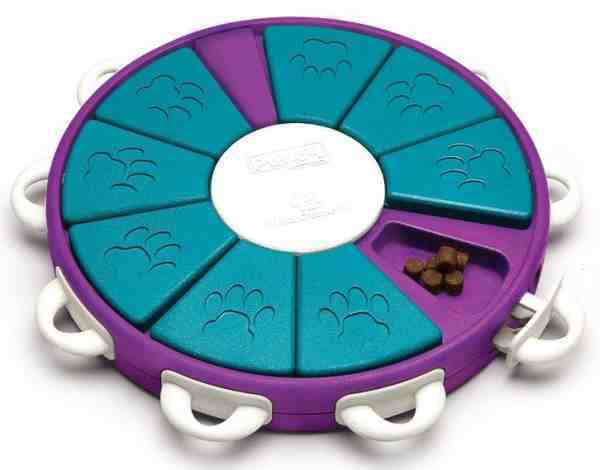 8.5" x 7.5" x 2.75"
Simply fill this treat ball with your dog’s favorite treats and give the ball to your dog to watch them play with the puzzle as they figure out how to release the treats. Small is 5". Large is 8". 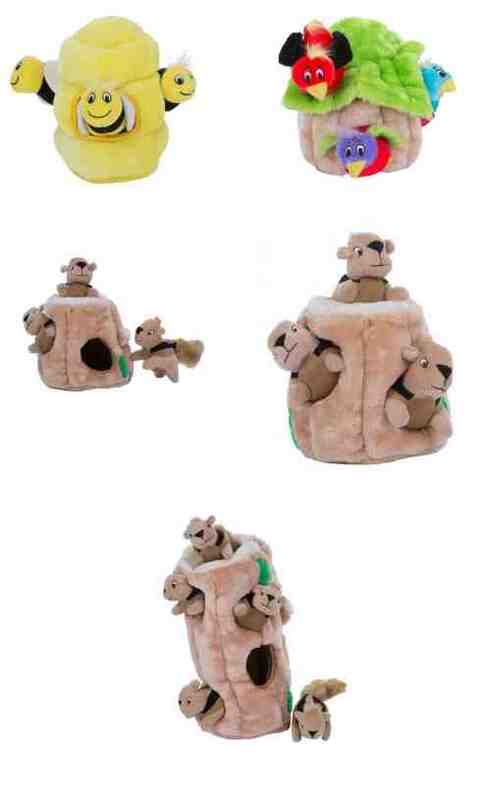 Stuff these toys with their animals for hours of dog play. Junior: 5" x 5" x 5". Large: 6" x 6" x 7".Jumbo: 7" x 7" x 8". Ginormous: 7" x 7" x 12. Keep your pup busy with a Burrow! Each burrow comes with three Miniz. Made extra durable for tough play, Z-Stitch™ Snakes feature Z-Stitch™ Technology, a special sewing technique created exclusively by ZippyPaws! 4 layers of fabric plus 3 squeakers! 6" cute toys for your dog's play. Each DiG-iT comes with three 4" squeaky bones. It squeaks. It glows. It's a touchdown! 4/cs. Display includes 24 footballs in a POP.